A widely respected name in the fashion business, Narendra Kumar has been involved with the fashion business for over 13 years. He is a graduate of NIFT, Delhi and also studied at the London School of Fashion. He started his career designing for ensemble. In 1996, he was asked to join the international ELLE magazine as their founding Fashion Editor in order to help establish the magazine in India. 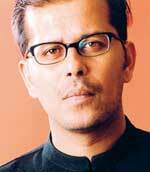 He continues to work with many fashion publications and is presently Consulting Fashion Editor of Verve magazine. Narendra has also taught design, pattern making, and draping and fashion history at NIFT. In addition he has been a Fashion Consultant for some of the top clothing brands in the market such as Raymonds, Reid & Taylor, Will sports and Levis. Amongst his many prestigious corporate clothing projects, Narendra was responsible for creating the look for the J. W. Marriott Hotel and the newly launched Kotak Mahindra Bank. Narendra started his own designer line under ‘Narendra Kumar’ for men and women and has two flagship stores in Mumbai and at 1 M G in Delhi, Delhi’s newest fashion complex where he is the only Mumbai designer amongst Delhi’s designer elite. Recently Narendra Kumar was approached by Harvey Nichols of London to supply his label and was also invited to Paris by the Director of the Galleries Lafayette Designer Studio to show his ‘Narendra Kumar collection to them for the Spring/ Summer 2004. He is also working with Simi Garewal for creating her wardrobe for her upcoming shows. For CHAI, his recently launched label, he is responsible for creating and designing the whole look of the line as well as working with Banswara for new textile developments and procurement. He is also responsible for imaging the brand for the Indian market.